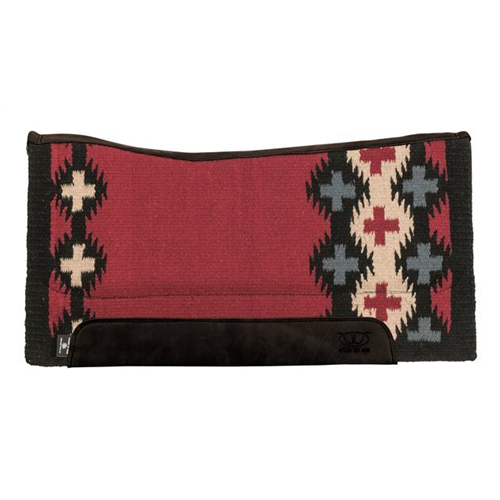 Designed to conform to and fit the contour of your horse’s back, this saddle pad reduces saddle roll and provides a better, more natural fit. This pad’s design is split down the center and reinforced with top grain leather. Sandwiched between two pieces of felt, the 1/2" impact-absorbing memory foam shapes to your horse’s back, returns to its original shape after each use and is ventilated for breathability. The 100% New Zealand wool toppers come in a great selection of Weaver exclusive designs to suit a variety of styles. 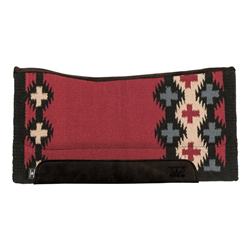 A brown orthopedic felt bottom conforms to your horse, wicks away moisture and helps absorb shock. The distressed brown top grain wear leathers offer protection and feature our Ride the Brand "W"insignia. Measure 33" x 38".